In January of 2010, Sherie asked me to help her get stronger. While we did do the same rides on the weekends, and similar weekday commute rides, she just didn’t improve as much as I had. She had noticed my discipline (sleeplessness?) in rising early each day to work out. And she had noticed how I have done different workouts on different mornings and always seemed stronger than her on our rides. So I agreed to help her plan workouts, and to track them. And she agreed that when I talked as coach she would try her best, and be in a role different than the usual spouse or friend role we already shared. So Ben put together “the spreadsheet.” It is a simple grid of planned workouts listed in the left column, with five columns to the right listing the weeks of the current month. This way Sherie could check off workouts as they were done to try to keep organized. Ben joins in (with some variation) when he is home, and talks to Sherie about her results and feelings about the workouts. Now Ben has a history of training for endurance racing. While a mid-pack runner and cross-country skier, Ben has had over the years semi-professional coaches, steady training partners, workout logs, and racing results. And has studied the better books and magazines about the sports. And Ben has always believed in cross training for multiple sports at once to keep balance in the body, and in having a training goal (or several) a year to focus on the next phase for a few months. In the last few years the focus has been ski trips, bicycle centuries, and backpack trips, with more specific training for a few months before the various events. With the new coach role, Ben has tried a bit with Sherie to do a bit more than just his old mantra to her: “Each week try to ride at least once fast, at least once steep, and at least once far. But not two on the same day.” Sherie has been a (mostly) receptive athlete for her coach. 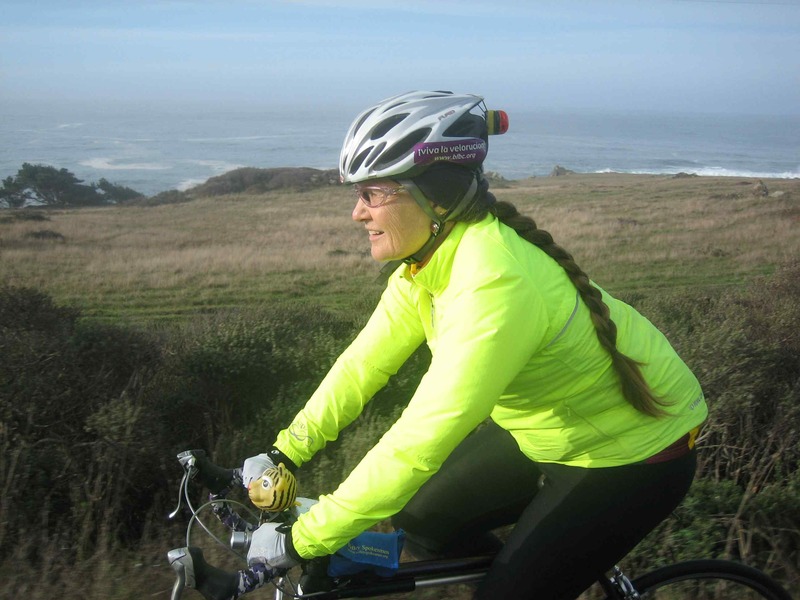 She has done the Pilates, the dynamic stretching, the free weights and stretchy band work, the hiking uphill and down (recently with a 30# backpack), the one-legged bike trainer spins, the hill climbs on the commute to work. And Sherie has even “enjoyed” doing bicycle intervals with Ben over the summer, working up to more reps, longer intervals, and faster sprints up short hills. The results are that Sherie has dropped some weight, as has Ben. Both of us have greater leg strength on our bikes for extra power reserves, and our VO2 max, although not measured, is certainly higher, as we cruise now at faster speeds. But with our new goal of the Maratona, Ben has changed the focus a bit. Sherie’s plan (actually the plan for both of us) is to spend December through February trying to gain leg, core, and shoulder strength while maintaining a decent aerobic base. In March and April we will work up the endurance with longer rides, while doing some intervals to nudge up the VO2 max. And then May and June we will concentrate on biking steeper terrain, longer climbs, etc. to really prepare for the passes in the Dolomites. Now of course this is our plan. But of course the plan has been/will be regularly interrupted by travel, storms, opportunities, and injury or fatigue. So we have been flexible, like riding over the December holidays on the Sonoma coast on those steep rural roads, including the famous King Ridge for Ben’s birthday ride. And leading (and “following”) on GPC rides regularly too. This entry was posted in Cycling, Grizzly Peak Cyclists, Uncategorized and tagged cycling, Maratona dles Dolomites. Bookmark the permalink. My advice that worked well for me, don’t worry about intervals yada yada, just do as much climbing as you possibly can at even tempos, climb, climb, climb, intervals won’t help much on the Maratona unless you plan to race it.